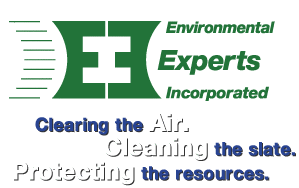 Indoor air quality testing and air quality issues. Finding the source of the problem. Eliminating or controlling the cause. In today's work environment, productivity can be significantly reduced due to poor air quality. Even slight changes in temperature, relative humidity, air flow, or carbon dioxide content can cause problems. The presence of radon gas, formaldehyde or other volatile organic compounds in materials such as sheet rock, rugs, and copy machines can result in worker lethargy or absenteeism. EEI specializes in helping companies address these potential problems in the early stages, before they become contentious issues. We perform site assessments, listen to your concerns and interview building occupants. If requested, we perform a survey and provide a detailed analysis of the findings. After isolating the issues, we establish a logical testing strategy. 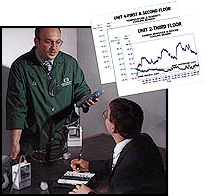 With cutting edge computerized monitoring equipment, your professional EEI team then tests all suspect locations, conducting evaluations at various times of the day under multiple conditions. Our accredited laboratory resources complete timely, detailed analysis of any volatile organic compounds (VOC), microbial organisms, particulates and other contaminants. Once completed, we provide clear and comprehensive documentation and interpretation of the results, and then provide solutions to any problems identified. Improperly conducted remediation can result in lingering concerns and problems. EEI specialists have the expertise to perform remediation accurately, thoroughly, quickly, efficiently, and with minimal disruption. With proven containment procedures and skilled technicians, you're assured that no harmful contaminants will be dispersed elsewhere in the environment.